Why, if I've selected "Anyone - including Anonymous Users" under comment settings, for "Who can Comment? ", do my visitors complain of having to login? This blog owner, like many others, does not understand the Blogger spam mitigation policy, in Blogger Comments. Blogger lets us select who we wish to allow to comment, on our blogs. When we do not moderate, they require authentication, to cut down on the spam. Moderated comments, with CAPTCHA ("Show word verification") not required by the owner, appear to go straight to moderation. Comment authentication makes genuine comments more normal. By requiring authentication, Blogger makes it more likely that a comment, awaiting moderation, will be genuine - instead of more spam. This encourages us to moderate comments more frequently - and helps us publish moderated comments, more promptly. And more frequent moderation discourages spam - and makes it more likely that we will see actual comments, later. Blog owners choose how to allow comments. 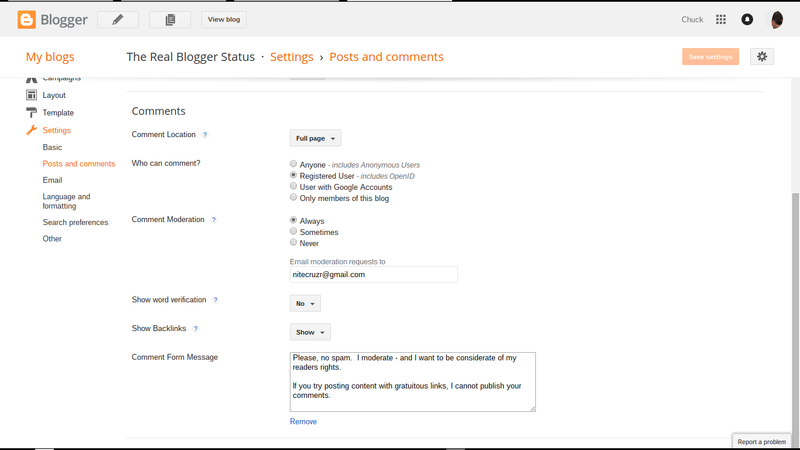 As a blog owner, it's your choice how / whether to allow comments. Anyone - includes Anonymous Users. Everybody with a Google, or an OpenID, account. Everybody with a Google account. Blog readers choose how to publish comments. Depending upon the choices that you provide, your readers choose how they may authenticate. "Anyone" allows a reader to comment anonymously - or identified. If they wish to comment anonymously, they login, using a CAPTCHA. If they wish to comment using a profile, they login, using an account. Login is generally only required, with the first comment. "Anyone" allows anyone to comment anonymously (if they wish). To cut down on spam, anyone commenting has to login. Solving a CAPTCHA lets them remain anonymous - but still identify themselves as a person, not a bot. Any comments, awaiting moderation, or published, are more likely to be genuine - not spam. They can login, as permitted, using a Google or OpenID account. Anyone able to login with a Google or OpenID account can still publish a comment anonymously, if they wish. If someone has to login repeatedly, to comment, they have a problem with identification, and filters. With cookies and scripts properly permitted, login (with the first comment) will be remembered (with any later comments). 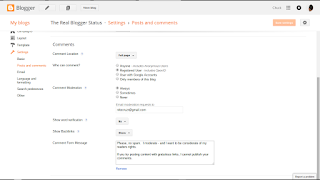 The Blogger / Google login status, and the ability to post comments, is sensitive to both cookie and script filters. Your readers may need to enable (stop filtering) "third party cookies", in their browser and on their computer - if they wish to comment, most easily. Both a #Blogger blog owner - and blog readers - get choices how to authenticate when commenting. Depending upon the choices made by the owner, the readers get more, or less, choices.